As to the Mathematical Society, of which I was a member when only 18 years of age, having been, contrary to the rules, elected under the age of 21. How I came to be a member of that Society - and continued so until it joined the Royal Astronomical Society, and then was the President - was: I happened to pass a bookseller's small shop of second hand books, kept by a poor taylor, but a good mathematician, John Griffiths. I was very pleased to meet a mathematician, and I asked him if he would give me some lessons; and his reply was that I was more capable to teach him, but he belonged to a society of mathematicians, and he would introduce me. I accepted the offer, and I was elected, and had many scholars then to teach, as one of the rules was, if a member asked for information, and applied to one who could give it, he was obliged to give it, or be fined one penny. On 10 October 1810 Gompertz married Abigail Montefiore, who came from a wealthy Jewish family with strong links with the stock exchange, at the Hambro Synagogue, London. They had three children, a daughter Justina Lydia born in 1811, a son Joseph born in 1814, and a second daughter Juliana born one year later. Gompertz himself joined the stock exchange in 1810 and he became a Fellow of the Royal Society in 1819. The following year he read a paper to the Society which applied the differential calculus to the calculation of life expectancy. In 1824, the year his 10 year old son died, Gompertz was appointed as actuary and head clerk of the Alliance Assurance Company. This company had been set up by Sir Moses Montefiore, the brother of Gompertz's wife, at least in part to put Gompertz's mathematical and actuarial skills to good use. 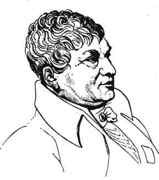 His expertise in this area led to his being consulted by government, including giving evidence to the select parliamentary committees on friendly societies in 1825 and 1827, and he did important computational work for the army medical board. His insights have remained central to the study of human mortality. [Gompertz's] rigid adherence to Newton's fluxional notation prevented wide recognition of his accomplishment, but he must be rated as a pioneer in actuarial science and one of the great amateur scholars of his day. Gompertz also wrote about scientific instruments, writing Theory of astronomical instruments (1822), A new instrument called the differential sextant (1825) and On the converted pendulum (1829). He was an early member of the Royal Astronomical Society and served on its Council from 1821 to 1829. In particular he assisted Francis Baily in producing a catalogue of fixed stars. This venture began at a Council meeting on 30 November 1820 in Baily's house when a request for accurate tables was put forward to which the Council agreed to do their best. Gompertz assisted Baily in calculating positions of stars which was eventually published as Baily's Catalogue giving the constants for 3000 fixed stars. Gompertz was a founder member of the Royal Statistical Society in 1834. He retired from his positions in 1848 but he took this as simply an opportunity to throw himself more vigorously into his mathematical studies. He published the mathematical work Hints on Porisms in 1850 and contributed a paper on the topic for which he is most famed, namely human mortality, to the International Statistical Congress of 1860. Although 86 years old at the time that the London Mathematical Society was proposed in November 1864, he was enthusiastic about the project which he joined after it was properly established at its first meeting on 16 January 1865. It was decided at this meeting that the Society would publish a journal, the Proceedings of the London Mathematical Society, and Gompertz began work on a paper which he intended to submit for publication. Sadly he died of a paralytic seizure at his home before he could complete the paper.